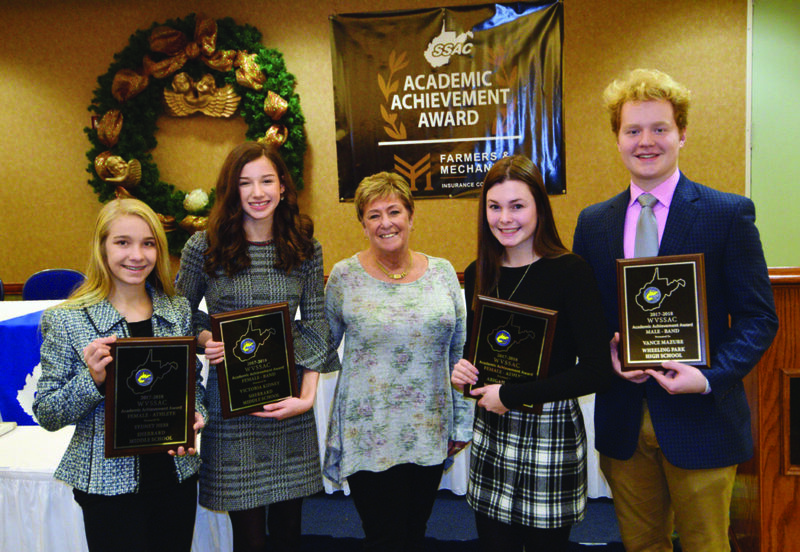 WHEELING — Students from Sherrard Middle School and Wheeling Park High School were among winners honoring top scholar athletes and band members from around the state during the 25th annual West Virginia Secondary School Activities Commission Academic Achievement Awards. The awards were announced during a brunch prior to the noon Super Six Football Championships at Wheeling Island Stadium between Martinsburg and Spring Valley High Schools. The event was held Saturday morning at the Wheeling Island Hotel-Casino-Racetrack. The deputy board members of the WVSSAC met in October to select the winners for this year, according to Chris Carder, Ohio County Board of Education member and member of the Super Six committee. The statewide recognition program involves overall school awards and individual awards for outstanding academic achievement. Local team winners included Sherrard Middle School’s girl’s cross county team winning individual team sport with an overall grade point average of 4.0, and Wheeling Park High School winning the band award with an over-all grade point average of 3.872. In individual categories, Sherrard Middle School students Sydney Hess, daughter of Michelle Hess of Glen Dale won the female athlete award and Victory Kidney, daughter of Timmi Snyder of Glen Dale, won the female band student award. Local high school individual winners included: Abigail Jones, daughter of Rick and Betsy Jones of Wheeling, winning the female athlete award and Vance Mazure, son of Mike and Brigitte Mazur of Wheeling, winning the male band student award. Students from Robert C. Byrd, Pikeview, Greenbrier West and Summers County High Schools, and Bridgeport and Notre Dame Middle Schools also represented winners from around the state. WVSSAC Executive Director Bernie Dolan provided congratulatory remarks to the students along with, Jim Dailey, Chairman of the Board Farmers and Mechanics Insurance, a co-sponsor with the WVSSAC for this year’s program and Wayne Ryan, WVSSAC assistant director. The racetrack has sponsored the event for 25 years. Dolan said it is a great pleasure recognize all of the winning schools and individual students. “We talk about students first because again that is the most important part. We all love to go to the games, but if you don’t take care of business in the classroom you’re not really a student athlete,” Dolan said. “These are the best of the best, whether it’s in the classroom or the field of play. These awards were based not only on your GPA but also your attendance — and those are great things that are going to carry you through the rest of your life. … Those are great attributes that you’ve learned from your coaches and parents and teachers,” he added. Dolan also took a moment to thank the WVSSAC board and the many organizers of the banquet, including Carder, who has been involved with the event from the very first year it was held. Following the event, Wheeling Park High School Band Director David Alfred said he was extremely proud of all of his band members for winning the academic achievement award for the ninth time, and the fifth time in the past six years. 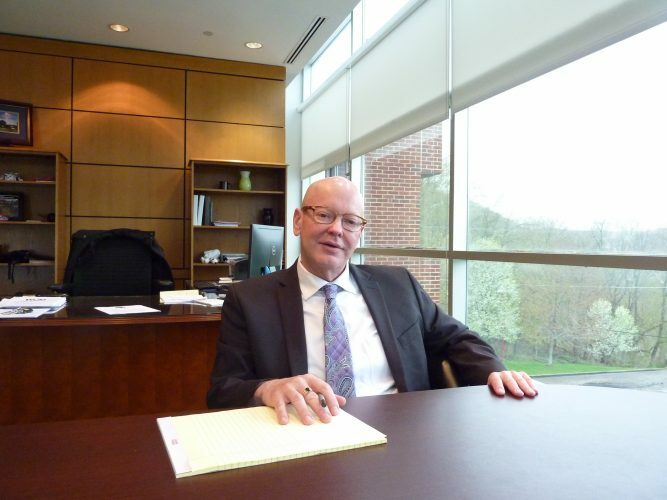 “So, the honor is that students in the band have an opportunity to achieve this type of success at Wheeling Park high School,” Alfred commented.